Over the past few years of blogging, I have entered many giveaways and won some awesome swag. I have also hosted several fun giveaways and I always love sharing great prizes with my readers. Several weeks ago I entered an online giveaway to win a package from Big Step Design that included a professional photography website and marketing materials. This was a big package valued at over $1200 and I thought my chances of winning were slim to nil. Still, I was struggling to get my photography business off the ground and I needed a more professional looking website. I knew that was a must. I had looked at several sites offering web design and prepackaged templates, but wasn't terribly excited by any of them. So, I entered the giveaway and hoped for the best, but really had little faith in winning. I was absolutely floored when I received an email telling me that I won the whole package! Not only a brand new sparkly website, but also a video portfolio and print marketing materials!! Seriously. I cried. There have been some financial changes in our family recently, and I was really needing to lend some more support to our family's budget. This was a huge blessing for me. I was overwhelmed with gratitude and just knew this would be the push I needed to get my little business off the ground. Shortly thereafter, I was chatting on the phone with Chelsea of Big Step Design about my vision for a professional website. She was so open and knowledgeable, and she really helped to guide my decision toward a site that fit my style and needs. I knew my business was in good hands and I couldn't wait to see the final product. We worked together over the next couple of weeks setting up the landing page and importing posts from my blog. Chelsea made sure that all my concerns were answered. She was a great resource in helping me understand the back end of the site and how to best utilize SEO to improve my web presence. My favorite features of my new website include the Pinterest style port folio and the contact form for client inquiries. When I saw the beautiful finished product, I was over the moon with excitement! 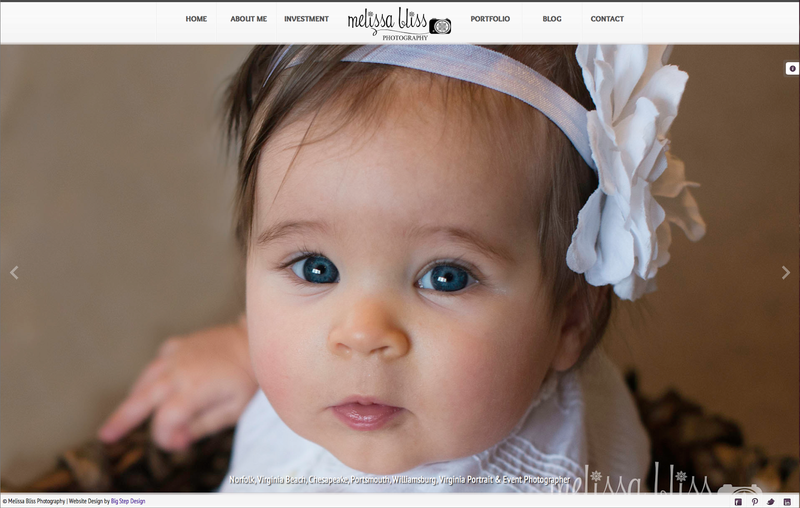 I absolutely love my new photography business website. The design is sleek and easy to navigate and it is just gorgeous. 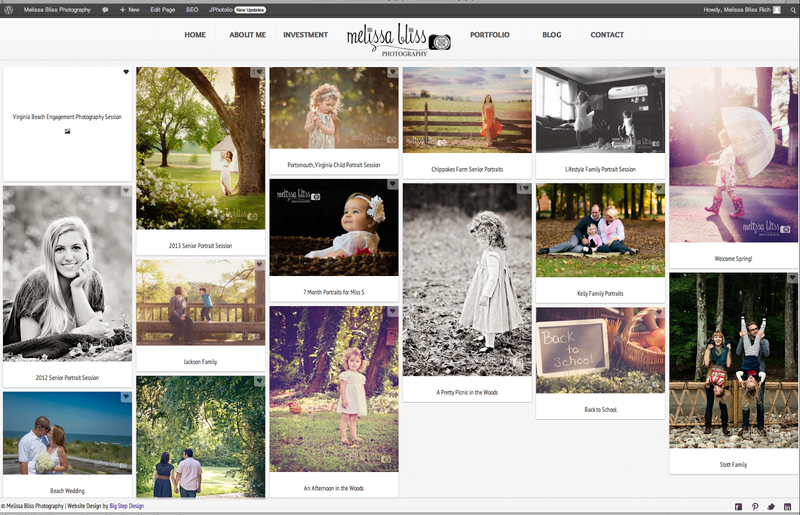 I am so thankful to Chelsea and Big Step Design for the wonderful work they have done for Melissa Bliss Photography. If you are in the market for a new website design, I highly recommend using Big Step Design. They offer fantastic packages especially for photographers, and they are so attentive and helpful. As a special treat for Serendipity is Sweet readers, Big Step Design is currently offering $100 off their packages! If you sign up through the links on this page, you will immediately be given a $100 discount. Here's a link to find out more about their wonderful website design packages: Big Step Design Photography Website Packages. Don't delay, go check them out! You won't be sorry. That is so awesome. I am so glad you won. It looks great! Melissa, I just stopped by there, and it is really fantastic!! Truly a generous giveaway, and what a great job they did for you. Congratulations!!! What a wonderful prize to win! The site looks gorgeous. Congrats. I'm so happy for you my friend- I have been over checking it out- it is GORGEOUS!! Your new website looks amazing! I'm so glad you like the site Melissa. I had a lot of fun working on it and it was super easy to make it look so great thanks to your amazing photos. I love the new site!! I would really love to hire someone to redo my photography biz website, but it's just not in my budget right now. I will keep these guys in mind, though, if I have that option in the future!